After talking about its 28-core processor for what we feel like was forever, Intel is finally releasing the Xeon W-3175X. Of course, this is a much hardier enterprise-level CPU designed to take on the biggest workloads, such as creating and rendering media, film editing and 3D graphics rendering. 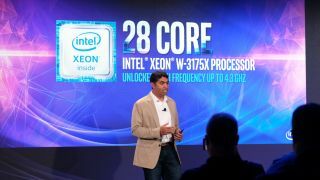 Not only will the Intel Xeon W-3175X do the work, it’ll work faster than other chips, thanks to its 3.1GHz base frequency, 4.3GHz single-core Turbo clock and 38.5MB of L3 cache. Likewise, this chip's supporting Intel C621 chipset is meant for production system builds. The chipset brings support for up to 68 PCIe lanes (44 PCie 3.0) and six-channel DDR4-2666 memory, which will allow users to pair this processor with up to a gargantuan 512GB of RAM.